While we have done several Viking river cruises, this was our first ocean cruise. 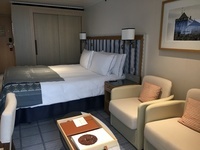 The ship is beautiful, love that everyone has a veranda cabin! 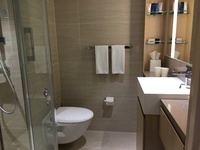 The cabin was roomy, plenty of storage space, the bathroom is also a great size and has the heated floor. 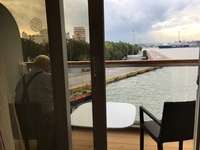 Our friends were in the cabin next door, so our Housekeeper pushed the veranda separation panel back, giving the for of us one big veranda - nice! The public spaces are beautifully done, and we absolutely LOVED the Explorers Lounge! The views are floor to ceiling all the way around, and since we were sailing in November, the fireplace made a perfect place to end the day. While this ship is obviously larger than the river ships, it still manages to give you a small ship feel. The service was exceptional, as always, and everyone delivered excellence at every turn. Loved all the ports except Corfu. That stop did nothing for me, especially compared to all the other stops. We did the included shore excursion in every port and the were great. We still had plenty of time to play in that city afterwards. We went to a couple of the entertainment offerings and a couple of the enrichment offerings. They did not seem as good or relevant as on the river ships - that was a bit disappointing. 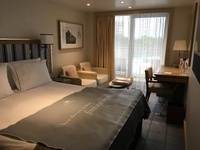 Overall - an exceptional cruise experience, as compared to other lines I have used in the past. I will absolutely do a Viking ocean cruise again, and of course - more river cruises! Great cabin - floor to ceiling sliding doors, so fabulous views. Plenty of room to relax and enjoy it, lots of storage space for everything. The bathroom has plenty of space and I love their brand of toiletries. The bed and pillows were very comfortable, always a pleasant surprise. The cabin was immaculate and our Housekeeper was awesome! Absolutely fabulous tour guide!! Beautiful city, fun shopping, tons of restaurants to choose from. LOVED Kotor! Hard to believe - but another outstanding tour guide! After the tour, we walked the waterfront promenade down to a large town square and had a great lunch. Also got to watch a giant pizza being made on a fired tile table, covered in hot ash. Very fun to see!